Hayas y robles en el hayedo de Montejo. Beech and oak trees in the Montejo beech wood., originally uploaded by Xosé Castro. In Spanish the name of the Beech tree is "Haya" and the word "Hayedo" means Beech forest. 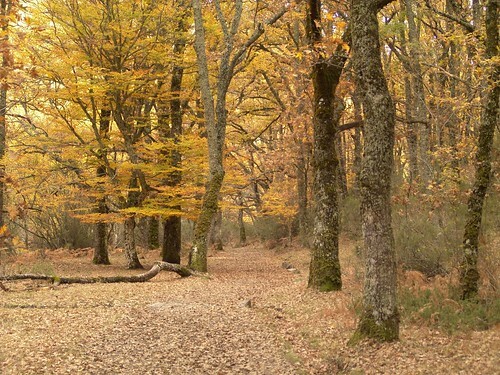 Near the town of Montejo (about an hour drive north of Madrid) there is a famous "Hayedo" or Beech forest. Apart from the fact that it is a very beautiful forest in its own right with the feel of being enchanted in spring and autumn it´s main claim to fame is that it is the southernmost oldgrowth beech forest in Europe. They say that Beech trees used to grow much more extensively throughout Spain but that over the centuries the changing climate slowly drove them north. Farther north from Montejo it is not uncommon to find "Hayedos".